This Sentech STC-HD93DV-KT C-Mount 720p Cased Camera Kit includes STC-HD93DV 720p C-Mount Camera, a power supply for the camera, and an HDMI cable to connect the camera to a monitor, switcher, or recorder. 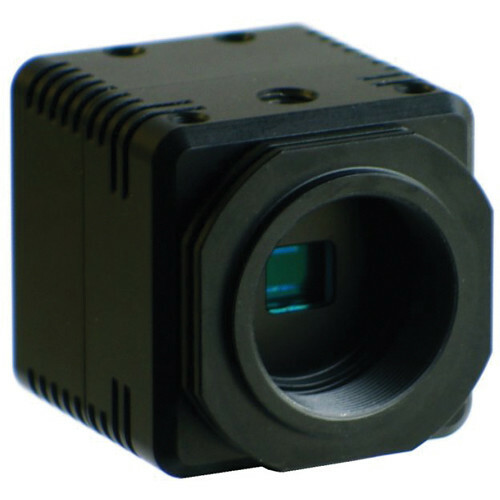 The STC-HD93DV Cased Camera is an HD digital output camera for use in applications that require direct-connect monitor viewing. This camera features a 1/3” CCD sensor that outputs a true HD 720p, 16:9 image at 60 fps. It allows you to program up to 28 individual DSP profiles for automatic control and features a programmable on-camera push-button for manual control. The PWR-DC12-500R DC Power Supply with Jack Connector supplies 12 VDC power to Sentech cameras. This power supply comes with a jack connector for easily plugging it into your camera. The Sentech STC-HD93DV C-Mount 720p Cased Camera with HD-DVI Output is an HD digital output camera for use in applications that require direct-connect monitor viewing. This camera features a 1/3" CCD sensor that outputs a true HD 720p, 16:9 image at 60 fps. It allows you to program 28 individual DSP profiles for automatic control and has a programmable on-camera push-button for manual control. The STC-HD93DV also boasts an ultra-compact size of 1.6 x 1.6 x 1.8”. Compact case size at 1.6 x 1.6 x 1.8"
Provide your camera with 12VDC power, 500mA current with the PWR-DC12-500R DC Power Supply with Jack Connector from Sentech. Plugging in your camera is easy with the included jack connector. Box Dimensions (LxWxH) 6.0 x 4.0 x 4.0"
Box Dimensions (LxWxH) 4.1 x 2.4 x 2.3"